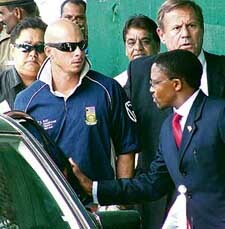 Avoiding the Delhi Police ever since the match-fixing scandal broke out in 2000, South African cricketer Herschelle Gibbs today appeared before its Crime Branch which said he was part of the conspiracy and confessed to receiving offers twice to underperform but he never accepted the offer. As a Divali bonanza, the country’s leading telecom operator, the BSNL, today slashed the STD rates by 58 per cent, enabling 1.16 crore customers to make calls across the country for Re 1 per minute with rentals and other benefits. Should stiff punishment be given to those employing children? The Punjab Government has introduced a one-time settlement scheme( OTS) with regard to the recovery of dues from defaulter farmers who had secured loans from cooperative banks. An irate mob today ransacked the house of the school Principal who had so mercilessly beaten up and insulted a student that he committed suicide yesterday. The mob also attacked the private school— Harminder Public School — and smashed its windowpanes and furniture. The US may be talking of the gradual democratisation of Pakistan, but the country’s army may be in no mood to relinquish power given its proliferating commercial interests. The Ministries of External Affairs and Home are understood to have sent classified reports to the Prime Minister’s Office regarding a disturbing development in the neighbourhood: regrouping of Jamiat-ul Mujahideen Bangladesh (JMB). A huge cache of sophisticated firearms, including automatic rifles, revolvers, cartridges, landmines and other explosives was found unearthed in the Behala area, near Kolkata today, following a raid jointly by the Army and the city police. Orhan Pamuk, Turkey’s best-known novelist and incendiary social commentator, today won the 2006 Nobel prize for Literature. In its citation for the 10 million Swedish crown ($1.36 million) prize, the Swedish Academy said: “In the quest for the melancholic soul of his native city, (Pamuk) has discovered new symbols for the clash and interlacing of cultures”.